Rakhi in 2018 is on 26th August. Avoid last minute rush and place your online rakhi order now. Quality Rakhi Gifts delivered since 1999. 24x7 support available for any query related to rakhi online purchase. 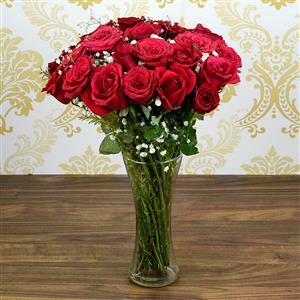 Surprise your dear one in India by sending this 24 Red Roses in the Glass Vase on any occasion and make him/her feel special. The vibrant color of the roses will surely brighten the recipient's day. Furthermore, you can also send this arrangement along with other Gifts to India through RGCards.com.